This book is an illustration album called Hwadiow. In ancient China, there was a tradition that people would make a jar of wine when a daughter was born, which was used to entertain guests when his daughter married. If her daughter dies before she marries, he will let relatives and friends drink this wine on the day of the funeral to commemorate the daughter who died. This wine is called Hwadiow. This album is about the paintings of young women from ancient China. The painters are fastidious about the clothing and accessories of various dynasties. Each detail is verified by textual research, but it is presented in a modern style. 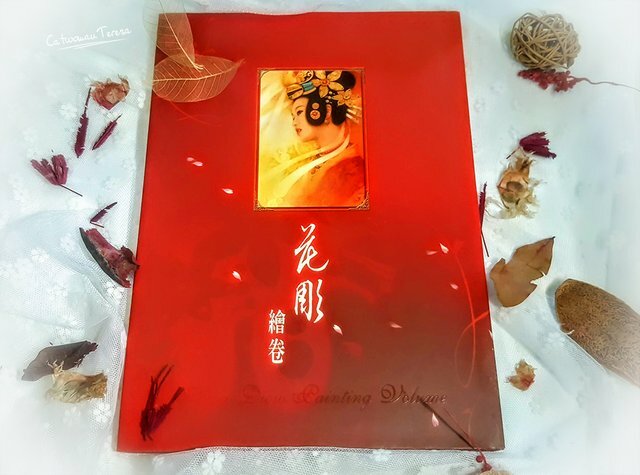 Therefore, it is different from the painting method of ancient ladies’ traditional painting, but it is a romantic and delicate illustration full of girls' rich emotions. The cover of the book also continues the classical romantic style. It uses a bright red color, which is reminiscent of the ancient wedding. It is gorgeous and lively, but have the melancholy feeling of youth wither, more accord with the theme of Hwadiow. Therefore, when I took this photo, I continued the theme of the book, using pure white yarn as the background to create a romantic wedding feeling. I also sprinkle dried flower petals to hint at the feeling of flowers falling and withered, hoping to appropriately set off the book. Haha ! I hope I can chance the world someday.